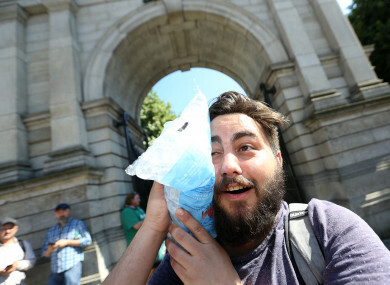 Benjamin Jourdan from France cools off using a bag of ice last month. IT WILL BE very, very, very hot this weekend. The weather forecast comes as Ireland gets set for a spell of what many countries call “summer”. Today will see temperatures around the east coast top out at 20 degrees, but that will feel cold compared to the rest of the weekend and into next week. Tomorrow will, according to Met Éireann, “be another dry, fair weather day” that will see temperatures rise to 23 degrees. On Sunday, that will increase to the mid to high 20s, with top temperatures predicted at at least 25 degrees. From Sunday, a period of weather in the mid to high 20s will make its way across Ireland, a forecaster told TheJournal.ie. Saturday will see temperatures reaching as high as 23 degrees in the inland and across the south, and 24 degrees on Sunday. Into next week, Met Éireann said there will be “very warm or even hot conditions” with “sunshine prevailing”. “The warmest weather so far this year possibly on the way through this extended settled spell,” the forecast added. Email “Temperatures set to hit mid 20s over the weekend”. Feedback on “Temperatures set to hit mid 20s over the weekend”.